Custom fields are created for additional details to be used in checkout processes that involves billing, payment, shipping etc. 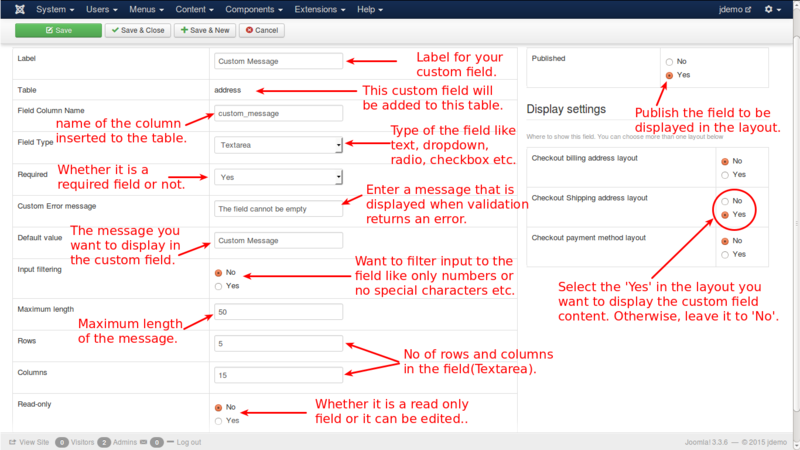 There are 2 types of custom fields: Core custom fields and Non-Core custom fields. 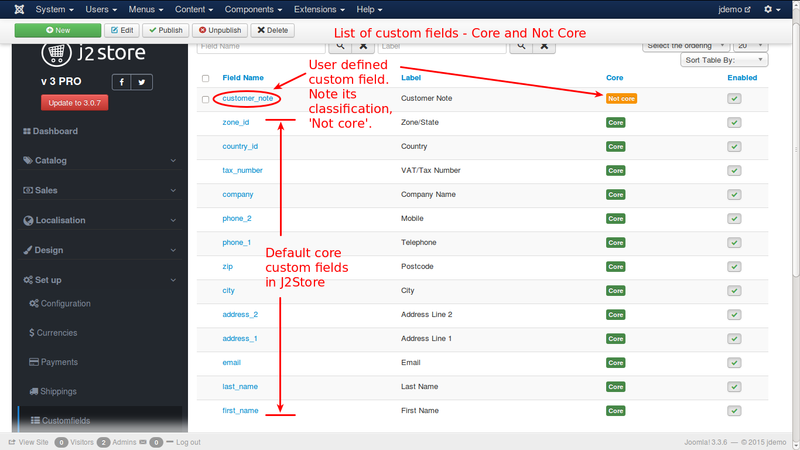 In J2store, custom fields by default are Core custom fields and custom fields that are created by users are Non-Core custom fields. Field Column Name – name of the column that is created. Custom Error Message – This message will be displayed to alert the user if it is required field and left empty on data entry. Input Filtering – select Yes and set the conditions if you want to filter out the input to this field. Read-only – If you set it to ‘Yes’, it is only readable and the content cannot be changed. Published: To display the field, it has to be published by setting this option to YES. You can select all of them or any combination of layouts or only one layout to display the field. You will see three layouts (billing address layout, shipping address layout, payment method layout). You can edit the billing and shipping layouts by re-ordering the fields or adding new custom fields. Ex: if you create the field called custom_address3 with the selection of billing address layout in custom field display settings and you want to display it in the checkout layout, then just add it in the billing layout section in the J2store configuration checkout layout tab.